Since I have been infected by the textile virus I try to combine my hunger for making trips to beautiful countries with the hunger for collecting textiles for children. Thailand would give me both opportunities: it is a beautiful country and I was told that you are able to find a lot of textiles. Of course I prepared myself as well as possible. 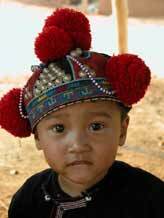 I read books, looked on internet, read the information given by Pamela Cross on the Tribal forum, contacted my, until then, virtual friend Susan Stem in Chiang Mai, collected small gifts for children and made some handicrafts for the ladies who are embroidering . I also made pictures of the clothing I am looking for and with these I made a kind of booklet which may be very useful in communicating with the local people. So in March 2005 I exchange Holland (minus 10 degrees) for Thailand (35 degrees Celsius). After 11 hours delay because of the snow in Amsterdam and 11 hours flight we arrive in Bangkok. Because of the delay we had to shorten our programme in Bangkok. I must say the first impression of Bangkok is not the impression I have of an eastern country. It is a huge city with a lot of people and, it seems, even more traffic. After an impressive visit to the old Royal Palace I decide to skip a walk through China town and took a boat to the River City Shopping complex. From Pamela’s articles I know that this is a place worth visiting. Indeed it seems like a museum and for the most things I see it’s like: “ OOOOH Don’t touch and just dream about buying something like this!” On the ground floor I see a small shop of a Chinese gentleman who is selling textiles. It seems that people who are infected by the textile virus all love to talk about their passion. This gentleman is so kind. 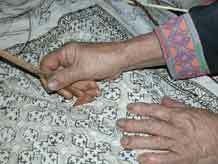 He shows me all kind of textiles and looks them up for me in a beautiful book. Unfortunately only Chinese text, otherwise I would have written down the title. 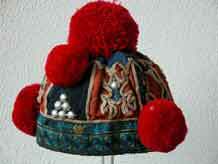 I buy two “goodies”; a hat from the Miao and a pair of trousers with boots (Han Chinese). They are quite expensive but you never know if you find more………..
Of course we visit all the interesting places: the klongs, the floating market Damnoen Saduak, the bridge over the River Khwai, Kanchanaburi, Ayutthaya, Phitsanulok. I am very impressed by the things I see, the nature, by the kindness of the people, the Buddhism, the markets, the delicious food. During a trip I always feel like a sponge, absorbing as much as possible, using all senses. The beautiful colour combinations, smells, sounds, tastes ……... My camera works overtime and I try to process all the new impressions. 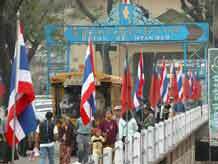 In Mae Sai, one of the few official land crossings between Myanmar and Thailand, we stop. 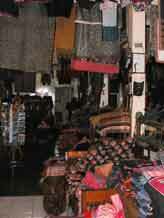 It is a busy town, a trading post where one can easily observe border life. 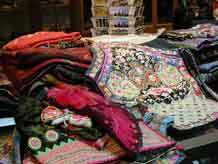 In the shops along the main street you can buy things like lacquer ware, gems, jade etc.. but my attention is fixed at textiles. In a small shop near the border I see a piece of textile in the window and with my little home made picture book in my hand I enter the shop and do my first attempt to point out to a lady, who isn’t speaking English, what I am looking for. The moment she sees the jacket of the Yao girl, a big smile comes on her face, she searches and searches and yes ………my booklet works! 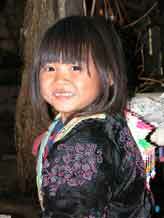 In her hand she holds a child’s jacket from the Yao! The negotiations about the price we do in body language! Both of us are happy! I also show her some of the metal pieces I am looking for. In a small box there are some, but she is not keen on selling them. I smile and say ´please´ and …… a couple of moments later I leave the shop with my new treasures. 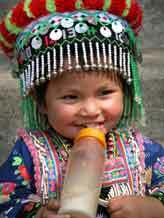 A Yao village near Chiang Rai: the first visit to a small village of one of the Hill tribes. 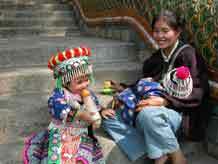 The Yao village looks quite prosperous, the people are living in concrete houses with a kind of corrugated metal roof. Since a couple of months there is electricity in the village. Life is changing in these villages! A smile comes to my face when I see that the moment we arrive women start running towards their small stands, while they are putting on their traditional jackets. 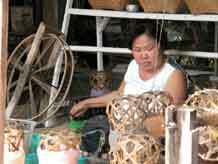 I have learned the Thai word for old: “kaw” and with my booklet in my hands I try to talk with the women. Like in Nepal, India and Tibet the people think it is odd that I want something old instead of a bright, new thing. One lady has got an old, boy's cap and she is willing to sell it. 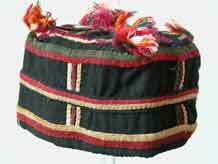 The price is more than reasonable and I don’t even try to bargain, it was such a lot of work to make a small hat like this! I give her one of the pin cushions and explain to her how to use the small thing to put a thread into a needle (needle-threader). While I am “talking' with the lady another young women comes along with another hat. Small pigs are walking in the street, looking for food. A little further a small boy is driving on his tricycle and he is wearing the most beautiful hat. I point out to his father, who is sitting near to him, that I would love to buy this hat. 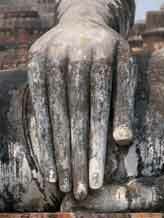 He smiles and shows his hand (five fingers, 500 baht), I smile back at him and say "yes" with my head. I notice that he is startled. Then a lady mingles into the conversation, I think she is the grandmother of the little boy. “No, no the hat is not for sale, the boy needs the hat!” she points out to me in gestures. She shows me another brand new hat, I smile and stumble the word “kaw”. Than she shows me a girl’s hat, which is not really old but …… I decide to buy it. I make some pictures of the little boy, so at least I have the memory of the hat. The lady offers me to have a look in her house. Very basic but okay and after electricity, television has also reached the village. 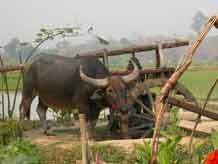 From this village we drive on to an Akha village. 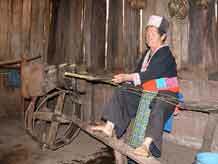 I am told that the situation of this tribe isn’t as good as the situation of the Yao. Pile houses seem to be glued to a hill, the roofs made of a kind of straw. This village looks poorer than the first one. Two women dressed in their traditional clothing come towards me. 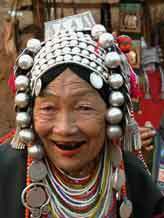 The oldest women (predicting their age is very difficult) is chewing on betel nut and dances a little from one foot onto the other. Her teeth and mouth are dark red and her eyes are showing that she is a little drugged. 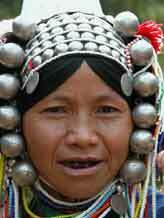 She wears a beautiful headdress with special metal/silver ornaments. I show them the hats I am looking for and repeat the word “kaw”. There is no old hat but one lady finds an old jacket. Although we arrive late in Chiang Rai, my virus urges me to go into the town to visit the Night Bazaar, which is held every evening . 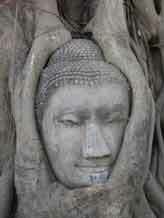 This one is much smaller than the one I will be able to visit in Chiang Mai. A lot of vendors have set up on the sidewalks and sell all kind of handicrafts; in the centre of the bazaar there is a big place where you can buy all kinds of food. The food is delicious here in Thailand! On a stage there is Northern Thai music and dance; fascinating how these women and men move elegantly and make you as a “farang” (foreigner) feel like a small elephant. Sometimes I try to move my fingers/ hands like they do but ………. We stay at the Golden Pine Resort, a place to be! A little outside of Chiang Rai but a beautiful place! From Chiang Rai we moved to Chiang Mai. 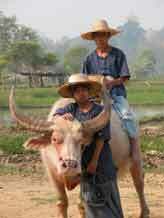 Chiang Mai is a keystone of any journey to Thailand. I stay at Galere Guesthouse, a wonderful small guesthouse at Mae Nam Ping river and within walking distance from the Night Bazaar area. 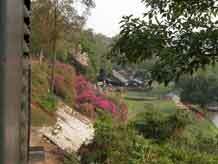 The former capital has more than 300 temples and is surrounded by hills. On the night of arrival we attend a Khantoke dinner and dance. 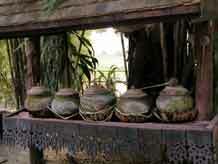 Khum Khantoke is a beautiful place where on a round rattan tray various kinds of authentic Northern Thai food is served. While enjoying the food one is entertained by classical dances which are performed by dancers and musicians from the Chiang Mai College of Dramatic Arts. Today I will be able to meet Susan and her husband, Robert Stem. Finally virtual becomes real! After making up plans and presenting some gifts to Susan, we drive to the Tribal Museum. 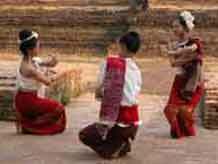 The exhibition includes a variety of items out of the daily life of the major tribal groups: Karen, Hmong, Yao, Lisu, Lahu, Akha, H’Tin, Khamu and Lua. As a first introduction it is nice, but I miss the finishing touch, the affection for the tribes……. but of course I have my personal guide with me, who makes this visit really worthwhile! After visiting the Tribal Museum, where I wasn’t able to touch anything, my tactile sense is satisfied in the shop of Bucklee and Kesorn Bell. Bucklee and Kesorn are friends of Susan and Robert and their shop is a kind of land of Cockaigne to me. I don’t know where to start looking and I am very happy when a glass of water is offered and I just can take a small stool to sit in the middle of hats, baby carriers, collars etc. The little hats, jackets etc. slip through my fingers and I smell the ooooh so familiar smells I know from Nepal and India. Who has made this hat and who was wearing it? 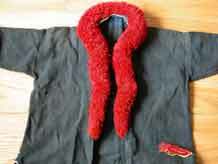 All kind of child-related textiles seem to whisper: “Take me with you! I am interesting. Look at me!” A pile of goodies starts to grow and when I leave the shop with Susan with my bag full of new treasures I think I am dreaming. Fortunately I will be able to visit this place several times. My dream continues in the restaurant that Susan has chosen for lunch: 'Whole earth' (on Sri Dornchai) is situated in the middle of a nice garden and it is a peaceful oasis. You don’t feel that you are in the centre of a big city. We take off our shoes and go upstairs to the balcony. Susan orders because she is familiar with the Thai food! The food is wonderful and I eat slowly to enjoy all the different tastes. Susan is a wonderful companion, I am so happy that she introduces me to all these beautiful places. 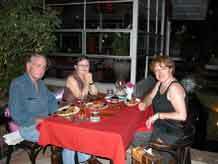 Susan and her husband Robert are the most kind people and they make my stay in Chiang Mai very special. In the next couple of days I have the opportunity to meet them several times. 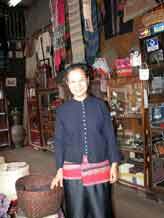 Susan also introduces me to Pa Ker Yaw, the beautiful shop from Bunrin (Rin)Thongdeelert. Rin doesn’t only sell textiles but also beautiful jewellery. 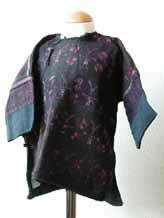 Rin just returned from a trip to China, from where she brought a beautiful Hmong jacket, which now is in my house. 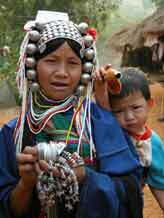 I also bought a very nice silver button from the Lahu which I will be using as a pendant. I was introduced to a Thai friend, Chaiya, by Susan and Robert, who is a guide and who is willing to join me on some trips in the neighbourhood. Susan and Chaiya talk about the programme. 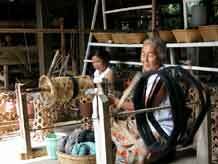 The first day we start at Baan Rai Pai Ngarm, the cotton textile museum, on our way to Doi Inthanon. 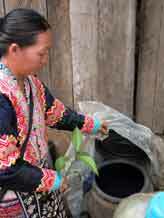 Along the drive to the beautiful teak house bamboo is planted. 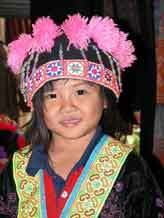 The daughter of Mrs. Saeng da Bunsiddhi welcomes me and shows me the way to the top floor where there is a nice museum. I take my shoes off and walk up the beautiful teak staircase. It is place really worthwhile visiting and I am sad that I am not allowed to take any pictures inside. 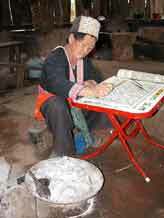 In the cotton centre you can witness the entire process from cotton production to dying, spinning and weaving. 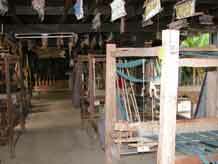 Underneath the house are the handlooms, the spinning wheels and all the equipment that is needed. 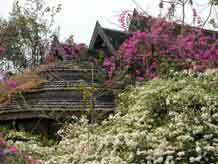 We go on to Doi Inthanon, the highest peak of Thailand. Unfortunately the views aren’t good today. 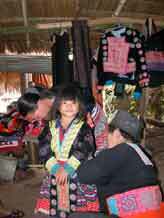 The slopes are home of some groups of Karen and Hmong tribes. 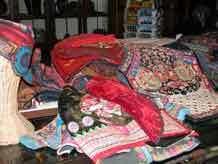 We visit some Karen villages to look if they have any textiles for children. In one off the villages we make a longer stop. 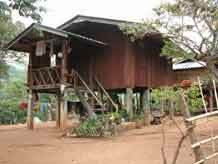 The village consists of pile houses. In the surroundings of the village you can see coffee plants. After the cultivation of cocaine was prohibited the queen started a coffee project. People were encouraged to cultivate coffee instead of cocaine. 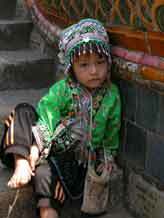 In front of one of the houses a young girl is weaving. I ask Chaiya to ask the girl if I am allowed to approach. I am not familiar with the weaving process but I see that the loom looks different from the looms I have seen until now. 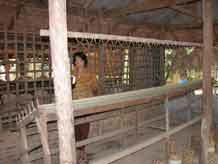 Afterwards I read in a book called “Hill Tribe Textiles”, that I bought in Suriwong Book Centre, that each tribe has got its own type of handloom. The loom I see here is a back strap body tension loom. 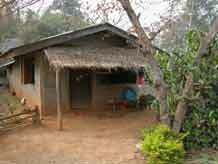 Chaiya knows the village and we go to a house to have some coffee. 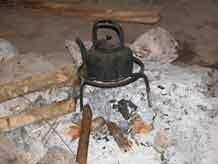 The lady of the house cooks water on a kind of 'bucket stove'. 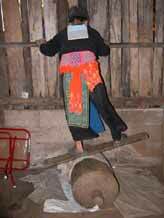 In an iron bucket she puts wood and a black burned kettle that exactly fits on top of the bucket. After a short while we can enjoy some delicious coffee. I buy some coffee for Susan and Robert. On our way back to Chiang Mai Chaiya wants to stop a the side of the road where some Karen women sell ant eggs. The eggs of the red ants are collected by the Karen and together with some green vegetable they collect deep in the jungle, the people here prepare a kind of soup. “Aroy!” (good) says Chaiya. I have already noticed that the Thai people eat almost everything that is walking, crawling, flying……..
We pass an old teak house which is empty and almost covered by bougainvillea. The house is a real beauty and it is a pity that it nobody is using the house anymore. 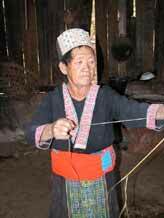 A visit to the white Hmong village, Ban Pha-nok-kok: Chaiya will take me to Samoeng and on the way to this village we visit a white Hmong village were he knows a lady who can show me something about production of hemp. We drive through the countryside and the bus takes us uphill to the village. 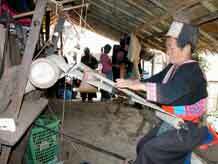 The lady invites us into her house and starts with showing how the bark from the hemp is peeled. 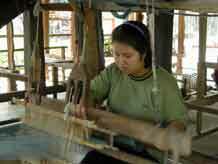 These fibres are rolled on to a wooden tool called “tin dua”. The fibres are spun, boiled in water with ashes from wood in order to bleach and soften the yarn, pressed with a big roller to make the yarn even more soft and smooth. 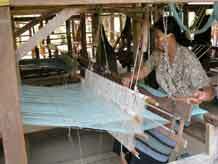 She also shows how she weaves the yarn on a Hmong loom; how she batiks the cloth; and how the cloth is dyed with indigo. 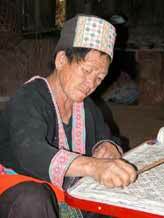 Back home in Holland I have a closer look at my book “Hill Tribe textiles “ and see that a lady in the book is the same lady that I have visited in the village. 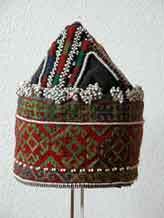 (See pages 60-67 of “Hill Tribe Textiles.” for an extensive explanation of the processes). Chaiya asks if they have any clothing for children. 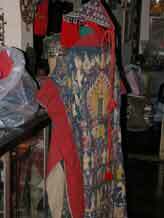 Her grandchild is called and the mother of the child and lady dress the child with skirt, jacket, aprons, hat. 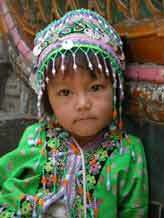 In no time the little girl is transformed into a small Hmong beauty. I buy several pieces of clothing and offer the old lady a pin cushion. A completely different way to get to know Chiang Mai is making a tour on a bicycle. I make a trip with Etienne Daniels from 'Click and Travel'. The trip takes about two hours (32 km) and Etienne knows exactly where to take you: a surprise stop at a temple where dancers were training, a funeral, lunch at a beautiful small lake, the park where the Tribal Museum was located etc etc. He organises different kinds of trips. By taking a bike you get to know the place in a completely different way. 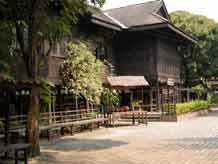 Together with Susan I visit the Sbun Nga Textile museum at the Old Chiang Mai Cultural Centre. This museum is something very, very special! You shouldn’t miss this place. Actually you should go there several times if you want to be able to absorb everything. More than 1,000 textiles are exhibited in an excellent way in sixdifferent rooms; regularly the exhibition is changed. 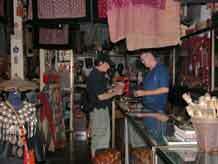 When you walk through the museum you feel the love for the textiles and the culture of Thailand. 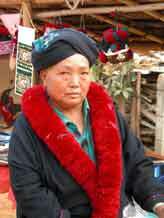 I saw some textiles from the Lao who looked very much like the little hat I bought from Susan. Unfortunately they didn’t sell any book or brochure, nor was I allowed to make pictures, so I have to rely on my memory. Well if you have managed until here I don’t have to tell you that this trip was great. I loved Thailand and had a great experience in the textile world, especially contacting Susan and Robert Stem, which made this trip an unforgettable experience! Again "thank you both" and also "thank you Pamela for creating the website through which I already have gathered so much information about my hobby!"